When it comes to houseboat insurance, many boaters get confused about how to go about properly insuring their house boats. Let's look at some of the basics, how to get the best policy and good value for your money. Are you looking for Houseboat Insurance? 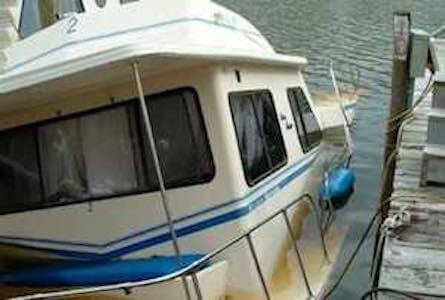 Having a hard time to get your houseboat insured? Are you looking to compare your insurance policy? Like to see if you can get better rates for insurance? You can get a quick, free insurance quote here. You don't want to be like this gentleman in the photo above, as he unfortunately found out afterwards that he didn't have the proper coverage for his houseboat. He later realized that he could have gotten better coverage, and much better rates by getting a quick, and free houseboat insurance quote here. What types of boating insurance is available for most houseboaters? What are some of the questions that you'll want to ask your insurer? Looking to find marine surveyors for insurance policy requirements? Like to see what "experiences" our readers here have contributed? What Types of Boat Insurance? Two of the most popular types would be Actual Cash Value and Agreed Amount Value. Click here to learn more about the advantages of each of these two insurance policy types. The Questions you Want to Ask? You want to ask your insurer about things like navigation limits, lay-up period, deductible amounts, boating course discounts, and accessory coverage etc... Click here to get the full list of insurance questions. Where to Find Insurance Companies? Not all insurance companies are the same, and they all don't have the same clauses, so we have compiled a list of the most popular sources of houseboat insurance companies here. The "Who & What" of Marine Surveys? When it comes to insuring your boat, many companies want to have a copy of a recent marine survey. We have a houseboat survey section that looks at the costs and the advantages of getting surveys, and also where to find a qualified marine surveyor. Houseboat Insurance - Where to get a house boat insured? No houseboat insurance, how do we get insured? Have a look at the Houseboat Insurance Directory.